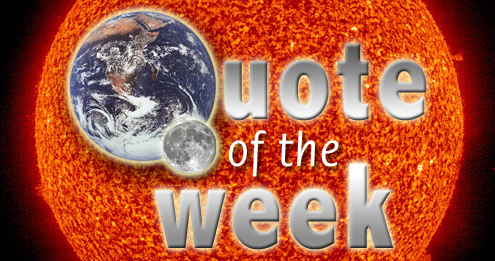 Quote of the week #33: What, no death spiral? | Watts Up With That? Quote of the week #33: What, no death spiral? “In retrospect, the reactions to the 2007 melt were overstated. The lesson is that we must be more careful in not reading too much into one event,” Serreze said. A timeline for the “breathtakingly ignorant” follows. April 3, 2010 in Quote of the Week. I almost wish we’d slip into another mini Ice Age just so these idiots will finally shut the [snip] up!!! I wonder if Dr. Serreze would like a little salt and pepper with that crow, as well as a glass of water to wash it down. DoctorJJ, the warmenistas will claim that the onset of a little ice age (or even a great ice age) is the result of global warming. AGW is non-verifiable: it’s never wrong. An ice age would be climate chaos and consistent with climate model predictions. People like Dr. Serreze that equate WattsUpWithThat with “breathtaking ignorance” yet still believe anthropogenic global warming have their logic caps on backwards. Pure and simple. No wonder they’re losing market share in public opinion. Nice to see you’ve cattle-prodded the NSIDC into submission, Anthony. Dr. Serreze should be more careful in choosing his friends, too. In retrospect he didn’t do himself any favors by cozying up to Joe “Climate Regress” Romm. The lesson is that when government employees shoot flames out of their mouths, they damage their agency and their careers. People like Dr. Mark Serreze and Dr. James Hansen have every right to make the most outlandish statements possible. But they should do so outside of their professional context. If they wish to advocate, there are plenty of think tanks – including liberal ones. But when people charged with the responsibility of collecting and maintaining national climate databases advocate strongly for certain positions – whether they are right or wrong – they allow questions to be raised about the validity and impartiality of the data collection process itself. That is the real lesson of Climategate. I wish they’d stop referring to the 2007 event as a “melt.” It’s well established now that it was a blow, a switch in the wind direction that broke up the ice and flushed it south east of Greenland. March 30, 2009 – Annual maximum ice extent confirmed – This year’s maximum was the fifth lowest in the satellite record. I’ve been following the Arctic summer melt since 2007 (not that long, but the satellite record ain’t that long either)- every year so far has seen an increase. This summer is also shaping up to be another very interesting year. It won’t be long (perhaps it is already partly obvious) before we will be able to tell just who is breathtakingly ignorant and who isn’t. I believe the Greeks called it “hubris”. Bad for skeptics too, though. Let’s just remind everyone to let the facts speak for themselves. Wild forecasts are basically guesses prompted by wishful thinking and agendas. So, is NSIDC publicly funded? Is it supposed to generally inform facts? Why the political comment to slur WUWT? So there is no agenda , right? I would call it “average” instead of “normal” there is no such thing as “normal”, and “average” is a matter of our extremely limited perspective. NSIDC is largely funded by NASA. I am proud to be breathtakingly ignorant! What is it Pachourie said about Indian scientists discrediting the claim that the Himalayan Glaciers would melt by 2035, “voodoo science”? Fire Serreze. He is funded by the taxpayer. Sack him to last week. But don’t you people remember? When the Arctic ice was in its death spiral, the polar bears got dizzy, fell into the water, and drowned. I’m sure I saw it documented somewhere in a Catlin report. Of course, they were pretty dizzy too. we may have to speak a bit louder, the greenies have their fingers in their ears.LALADUMDEDUM cant hear you! Don’t we need some volunteers to go on the Pluto mission? Are Hansen, Serreze, and Mann (Judy?) healthy enough, we really need to encourage these folks to do some real important science – they seem stuck on stupid, maybe they still can think? Besides this admission I also can’t find the video of Al Gore saying Arctic Ice could be gone in 5 years on YouTube anymore. Are they taking the focus off North Pole Ice?? How do we know it isn’t “rotten” ice ? Was there a concerted effort within NASA to influence the reporting of the temperature, solar and sea ice data in order to support the catastrophic anthropogenic global warming narrative? Maybe we should get this guy to make a statement to the Climategate Whitewash Squad. JAXA nows shows ice extent highest on record for the date. Only until August, when they’ll point to the decrease in ice cover compared to March as proof that the death spiral is worse than we thought. Why is it that every time i see “death spiral” I picture a planet-killing pinwheel? Ice recovers! Polar bears, penguins, and Santa breathe a sigh of relief. Pay no attention to that man behind the curtain meaningless ice data. Look instead at our calamitous computer game model projections. Maybe OT but this might make Dr Serreze feel a little better (I’m unusually charitable this evening, must be the wine). Whats wrong with this graph? Here they do the opposite to the temp “adjustments (ie GISSTEMP) they make the past “higher” so the present looks “lower” LOL You see up to1979 to 1995 ALL years above then after ALL below. That the good DR has learnt a painfull lesson about AGW? But they need solid ice to perform their death spiral. Am I going to trust Jonathon Leake to accurately quote Dr. Serreze? Nope. I’ll wait and see what comes up on the NSIDC website tomorrow. Duke University. He’s beginning to realize he is ah, naked?. In spite of all these arguments only one Member of Parliament had enough guts and common sense to vote against the white wash. We are told that this is a Democracy and by using our votes wisely we can change things. When practically all the candidates appear to be brain dead what the Hell are we supposed to do? Really unfair the way you quote their own words back at them. It so spoils the hyperbole. Very funny. Maybe just a micro-ice age, of duration 3-5 years, and Wikipedia would be forced to declare “climatology as-we-know-it” amongst the dead languages. I think Anne Cross unknowingly has drawn a historic parallel in American pop-science, albeit in it’s advanced stage, that we skeptics may use as a model to confidently predict the future of AGW-ology. I’ve been to Joe Romm’s site a few times and one thing that has always struck me as being very annoying is that every article he links to goes directly to another article in his blog. It’s like he’s such a control freak that he refuses to link to an off-site article unless it has been thoroughly vetted by his minions. Contrast that with the WUWT policy of regularly linking to external off-site resources (from all sides of the climate change debate) and it becomes increasingly clear which site is more open and honest. One of the conclusions made by APL Univ. Washington is that the 2007 event and Arctic sea ice in general is driven by wind patterns. They conclude that those patterns have not been favorable for the growth of sea ice in the Arctic since the 1980s. So, we pull the thread and find out that yes it is the wind but no we don’t know why… So we just don’t know…yes? Lindsay, R.W., J. Zhang, A. Schweiger, M.A. 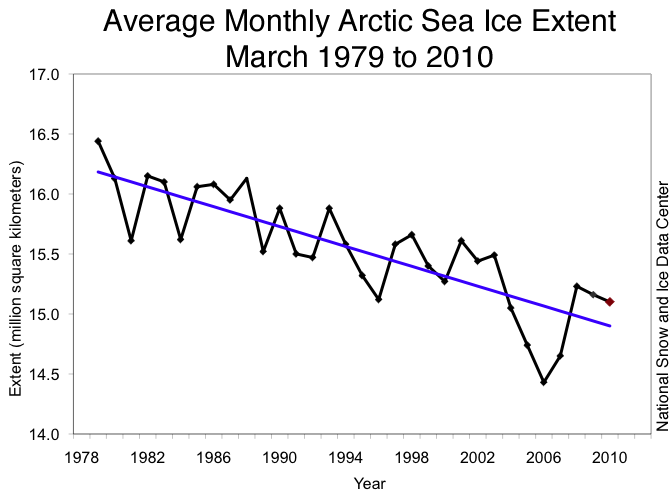 Steele and H. Stern,’ Arctic Sea Ice Retreat in 2007 Follows Thinning Trend’, J. Clim., 22, 165-176, doi: 10.1175/2008JCLI2521., 2009. JOE romm is a control freak. He of course deletes comments that include truth and quote his defective claims. Seems like the ignorance of the warmists has been breathtaking. Like he says, they need to ramp up their narrative. We used to call that spin. Romm was the one that blamed an air disaster on global warming and lied when he said droughts in the Southwest are permanent. I love the internet! It makes comments by public figures permanent. Just do a little searching and you can catch them making a fool of themselves so easily. Cryosphere Today and others present a history (time series) of Arctic ice extent. An important topic is, how did they create their reconstruction? Technology has changed dramatically over the decades. The ways of interpreting data have also changed. These are true even during the satellite era. So, somehow the ice scientists have combined ice estimates based on varying technology and algorithms. That can be a daunting task, even for statistically-trained people. How did they do that? it’s an important question. I suspect that the time series for the last ten years are so are OK. Prior to about 2000 the grafting and shifts in methods become important, such that I imagine the error ranges for the 30-year time series are quite wide. The story of ice reconstructions may be as interesting as the story of global temperature reconstructions. For those interested in exploring a part of the mystery, look at the step change in ice extent in the late 1970s, as satellite data replaced aircraft and ships. What that real or was it the result of a change in technology? Hey buddies: Have you noticed that, instead, your economy has been steadily melting away, and all your factories now work in the third world and your money is in less pockets, save in fiscal paradises, while you are worried about the polar bears´ice?. Skepshasa (05:36:42), the wind change was pointed out by Pamela Gray last fall. I made a mental note because that seemed to me like a reasonable reason the ice would become more concentrated and thicker. Now I’m starting to believe it is even more important than small changes in ocean temperature that I previously thought was the main contributor to the Arctic sea ice volume. Although, I still think both are relevant. The problem with statements such as “death spiral” is that time will either show you to be right or wrong. So far it has shown the fear mongers to be wrong. Futhermore, according to NASA, the so called melt of 2007 was mostly due to wind and currents with aerosols having played a part since 1979. Now here’s deliberate ingnorance for you! IF AGW is false then time and the weather are on the side of the sceptics. It looks like the only site that hasn’t taken the video down is TED’s — a collection of video seminats. 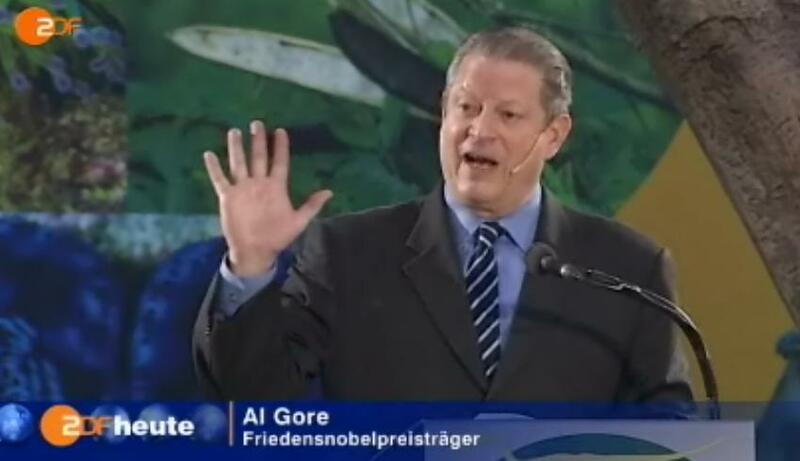 The video was shot in March 2008 — after the obligatory exhortation to strive to live carbon-free, the relevant “The ice cap will be gone in five years” spiel begins at 05:17 into the tape. In 25 years, American and Japanese scientists suggest that perpetual summer will reign. This prediction is based on the Arctic ice cover of 2007 shrinking to its smallest size in recorded history. If I understand the reports from climatologists of many nations, natural ice will become a thing of the past. The so called “tipping point” has been reached and the remaining Arctic ice cover does not stand a chance of rejuvenating itself. It is just too hot. Observations such as disappearing ice sheets are real evidence of rising global temperatures, not some measurements made from ocean buoys or satellite recordings. The ice is melting and even the nation’s of the world want to plant their flags in the Arctic to control the natural resources now being revealed and made accessible by a reluctant mother nature. Imagine the top of the world dotted with oil drilling rigs like those in the North Sea or Hibernia or the Gulf of Mexico. The National Academy of Sciences reports that the Northern Hemisphere is the hottest it has been in two thousand years, while the entire Earth is the hottest it has been in four hundred years. The planet is running a fever and during the twentieth century the Northern Hemisphere temperature rose by one degree. The tagline for The X-Files was “The truth is out there.” Unfortunately, so is garbage like the above. Not to worry, Seresese will be fired on January 21, 2013. I completely agree with prevailing opinion about blips and bumps in the ice record. These are caused by local weather pattern variations. What I don’t agree with is the jump from what is essentially taking a data string (pick a point, pick the number of years cuz it don’t matter) made up of blips and bumps, averaging it into a linear trend, and calling is AGW. The resulting statistical trend is an artificial construct that has no information in it that can lead to any hypothesis as to cause and effect. Brain on Easter Sunday morning Irish Coffee in the tank: “is” for “it”. Brain on black coffee: “it” when I mean &^$* “it”. Do the math. “This is weather,” said Serreze. “Don’t conflate this with climate.” Serreze notes that on the Atlantic side of the Arctic, ice is low. So you will notice the message isn’t changed, it’s just toned down with more nuance. Translation: The ice growth in the Bering Sea is due to weather… ignore that. For the true climate signal go to the Atlantic where ice is below normal. For those that have been following the regional ice status, the only regions that are significantly below normal are Baffin/Newfoundland and the St. Lawrence Basin, both below 60N. All others are at or above the 1779-2008 mean. BTW, I can’t let him get away with the “If you look at the rest of the Arctic Ocean proper, it is very warm.” How can it be VERY WARM when it’s covered with ice. Serreze is nothing more than a spinmeister and propagandist minstering over the death spiral of his credibility. Pride has no calories. Swallow your pride, AGW promoters. Telling the truth is extremely nutritious. Tell the truth, climate scientists. And your money is in … CEF, IAU, IGT or ZGLD (ETF traded Gold shares)? One must allow for “late vocations”. Congratulations to Dr. Serreze for having a belated (only three years!) moment of self-knowledge. Try to keep that one in the memory banks for the next time you find your finger inching towards the Panic Button, Mark. Well, if wattsupwiththat is guilty of displaying ‘breathtaking ignorance’ by exposing climate fallacies thrown at us via the unquestioning lamestream media, give me ‘breathtaking ignorance’ every time. “Dr Mark Serreze, of the NSlDC, said parts of the Arctic were going through an unusually cold spring – but that other areas were warmer than normal. It reminds me of 1984, where the main character’s job was to remove news from past newspapers. If that is true, how can we be below the average for this date? That’s not the exact video I was talking about. But still it has his histrionics about North Pole Ice in it, and with many more details. The one that is now gone was him in a Museum in Germany and he hold up his hand with all his fingers open to show all 5 of them and saying “5 years” as he is doing it, so as to add visual alarm to what he was saying in verbal alarm. So, why is this video gone now? I also won’t conflate his job title with him actually being qualified to have that job. Well, Steve (Goddard), I’m hoping your analysis about this year proves correct. Everywhere, one still finds references to “dramatic decline” “Increasingly worrisome” “worse than we thought” . We really need a few years above “average” to blow a hole in this nonsense. I didn’t think it would be, given that it was shot in March and the one you and Carsten mentioned was from December. I figured Uncle Albert would use it in this one, though, because it looks like a rehearsal for his 2008 World Tour, and Gore keeps the same material in his act. ooops. Mayday, Moderator — server-burp double post! So basically we should be more skeptical ?!?!? Isn’t that all that we have been saying… I do not know many people who are skeptics that claim that there is NO correlation to C02, only that the amount of warming that is being projected seems, much like the aforementioned 2007 ice free melt, a little unlikely. Not to say it cannot happen, just that according to the data these projections are based on wild assumptions. Still it is nice to see egg on their face, unfortunately the media has no long term memory. My rules of propaganda, a couple of them anyway. Rule number 1: Never attack the message. Always try and discredit the messenger. Rule number 2: Average or normal is not newsworthy. The outrages is always newsworthy. Rule number 3: Never place your claim in a scientific or historical meaningful context. Is Joe Romm always grouchy? I visited his website a few weeks ago and posted on on or two of his recent articles. When I returned I found one removed and I was banned from posting more. The one that was removed asked whether NASA GISS could make accurate predictions 9 months ahead. I know the weather can be predicted 5 days in advance and that models can predict well into the future but I wasn’t aware of tools that could predcited the global temp for this year or next year for example. When I emailed him to ask why he banned me he told me that GISS make prediction and he was sick of answering tiresome posts. I obvious mailed back to say the wasn’t much hope for a open debate when people take high minded positions. Needless to say he hasn’t replied. One wonders why he bothers to keep a climate science blog if not to explain climate science to online Joes. (Since then I’ve realised the present El Nino conditions can give a good indication of future global temp 7 months into the future. It wouldn’t have been difficult for Joe to post that). He’s been having a bad year, that’s all. Since 2008. He runs a climate blog, not a climate *science* blog. You’re better off here — you’ll usually find more science in one thread than a week’s worth of posts at some sites *and* knowledgeable will answer your questions. Granted, some folks can get a bit tart in their answers, but you *will* get answers. HR, I was banned from ClimateProgress for having the temerity to suggest that Joe Romm’s bet that average temperatures in the second decade would be .1C higher than the first was very weak compared with his stated beliefs. He had stated that an increase of .2C was nearly certain, so I suggested he should base his bet on that position. For that, I was banned forever. ClimateProgress isn’t a climate science blog. Joe Romm has an audience to which he plays and from which he makes a living. As such, he’s much like Rush Limbaugh, and whether either of them believes all the stuff he says doesn’t matter. It’s pointless to analyze the arguments used by either Romm or Limbaugh on some rational basis, because it’s just theater. Romm is reporting to us from Venus, where he has set up operations to finally prove that CO2 does in fact create global warming. A better description would be “breathtaking arrogance” by people paid from our tax dollars. Besides the federal tax dollars, Colorado taxes go to pay for salaries and operations at NSIDC/CU. Having said that, most people at NSIDC are very responsive an thoughtful. I found this screenshot from the now “disappeared” video, where he holds up his 5 fingers. The video was from the german TV channel ZDF. I see a new trend and I am quite sure people like Serreze won’t like it. AGW propaganda has backfired and ClimateGate reached the core of the UNIPCC! Governments all over the world now are reducing their budgets for climate science. The scientists have done their job and the UN traveling circus of at least 20.000 fat cats scrambled to save the world only worry is if they decide for a permanent host for their meetings or stay on the fast lane with exotic destinations like Bali, Morocco, Denmark or Mexico. We will be debunking warmist for many years to come while the UN fat cats continue to skim the revenues of our economies. Happy Eastern to all of you. Even thou Anthony is great for the time and effort to put this blog on and put on the good fight, it would be for naught if it wasn’t for the fans of the blog and the good people who have responded with great answers and insightful posts and articles. I’ve learned so much from this site that I can only say, Thank you very much! Good job. Bah, ignorance is a known state in which all men reside. Science came about as a means to alleviate ignorance. Alas, the realm of science is housed by men, thus corruption and self-will abounds. To push towards a reduction of ignorance is a noble undertaking, one to be admired and lauded. Working to confuse and contemn the scientific process is blatantly and unforgivably evil. Yet history is replete with it. Up the struggle! Anyone else just seeing another professional student defending his religion? I Gordon Brown proposing to print climate money! Anyhow, if we don’t stop mrons like Brown now they will make mess that is going to take generations to clean up! Emotions and appearances can be misleading…it happens to everyone. “So we feel like we’ve really learned a lot on our personal scientific journey,” he added. 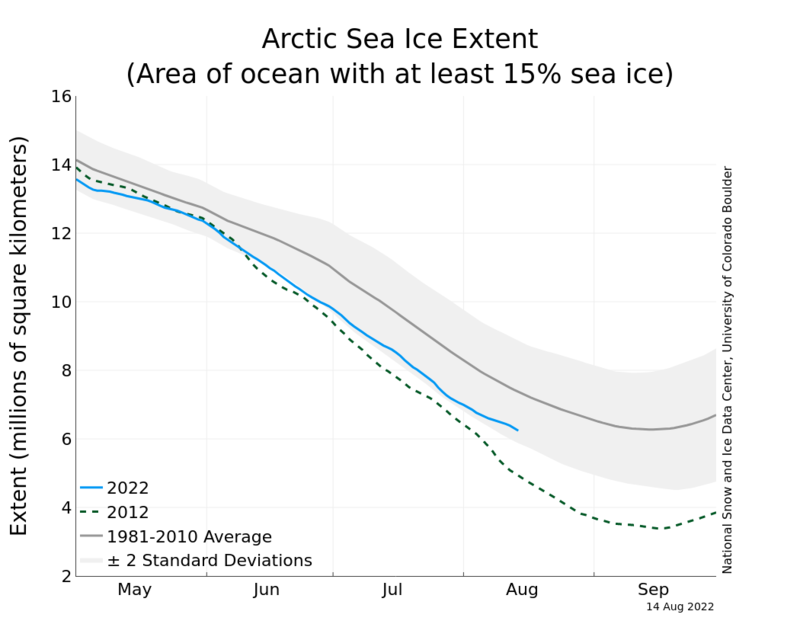 Arctic sea ice has declined for the third year in a row and is right on the trend line. How many folks making comments here have a science degree, have passed 4th year courses in analyzing stochastic processes, or passed 4th year theory of statistical inference courses? Just asking. 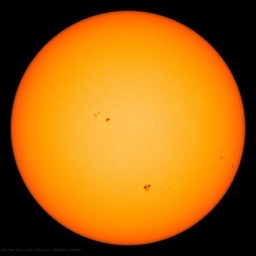 Extracting trends, or patterns such as the 22 year sun spot cycle, from the noise of weather and ice area observation takes a lot more than 4 years of data.